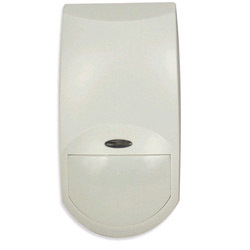 The HAI Wireless Quad Pet-Immune PIR is a pet-immune passive infrared motion detector that can send instant alerts to your HAI OmniLT, Omni IIe or OmniPro II automation controller (all sold separately) via the 64-Zone Wireless Receiver (sold separately) when motion is sensed within its wide range. Best of all, your pets won't be able to trigger the motion sensor. Its built-in quad-element detector reduces false alarms that can be triggered by pets up to 60 pounds. Mount the motion sensor on the wall or ceiling using the supplied hardware. Its 90-degree wide-angle lens can sense motion within a 50-foot by 50-foot area. Avoid direct sunlight, but with the HAI Wireless Quad Pet-Immune PIR motion detector's high white-light immunity, you'll have wide flexibility in sensor placement. Additional features include an automatic power saver mechanism that enables transmitter activation only 2 minutes after the last movement was detected to sustain the life of the battery.